Wynyard Woodland Park (formerly known as the Castle Eden Walkway) started life as a working railway carrying freight to the ports along the River Tees. Now it provides visitors with miles of flat footpaths, numerous circular walks and a fantastic landmark play area. Housed in the old railway station and a great visitor centre. Visitors can try their hand at weaving or woodturning and can participate in ancient country crafts and skills at one of the many events held throughout the year. The park is also home to an Observatory and 70 seat planetarium which is available to schools, groups and visitors throughout the year. Here the universe can be explored even on cloudy days..
Or why not come and sample a light lunch, a selection of baked potatoes or a choice from the speciality sandwiches on offer at Cafe Tees, in the heart of the park. The Visitor Centre, which is home to the Gift Shop and Farm Shop. Planetarium, where you can get a virtual simulation of everything on display in the heavens above. Observatory, where you can actually view the night sky with your own eyes through one of the largest telescopes in the North of England. Railway Carriage, which is the schoolroom facility for the site and is an ideal base for any field trip. The Tea Rooms, where you can get some of the finest wholesome specialty foods available in the area and a diverse range of refreshing drinks. Thorpe Thewles was a small country station located on the Stockton and Castle Eden branch of the North East Railway approximately 5 miles north of Stockton-on-Tees and slightly northeast of the village it served. The line was opened for traffic by 1882. 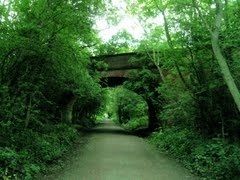 The branch itself was an important part of the railway network, taking pressure off the heavily used routes around the Stockton area. There was never a great potential for passenger revenue, as the communities served were quite small. Around the turn of the nineteenth century Thorpe Thewles itself only had a population of around 300. Nevertheless, in the 1930's, the branch was provided with 5 trains a day in each direction between Stockton and Wellfield. The bulk of traffic was coal, together with materials for the regional industries especially shipbuilding. The line connected Teesside with Sunderland and Tyneside. Hay, livestock and clover were the usual goods cargo handled by the station, and there were coal drops to serve the surrounding community. Thorpe Thewles station closed to passengers on 2nd November 1931, and closed for goods traffic on 2nd. April 1951. The line continued to be used for through traffic until 1968.